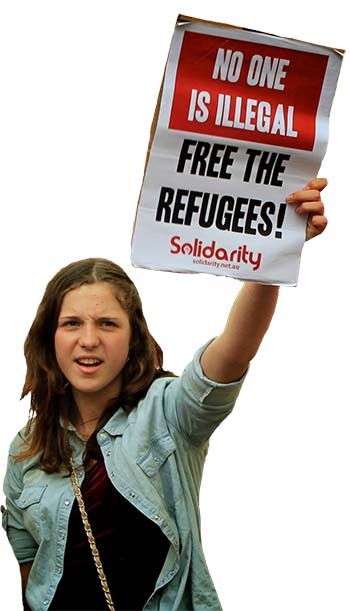 Solidarity is a socialist group with branches across Australia. We are opposed to the madness of capitalism, which is plunging us into global recession and misery at the same time as wrecking the planet’s future. We are taking the first steps towards building an organisation that can help lead the fight for an alternative system based on mass democratic planning, in the interests of human need not profit. The name Solidarity invokes one of the basic values of working class struggle—standing together in the fight for our rights. But it also stands for the wider solidarity we want to see uniting those fighting for change around different issues into a united fightback against the capitalist system and the ruthless drive for profits that dominates our world. We’re committed to building social movements and the wider left, through throwing ourselves into struggles for social justice, against racism and to strengthen rank-and-file unionism. We’re active in the movement for refugee rights, the student movement and the fight for education and as activists in our unions. Solidarity is a member of the International Socialist Tendency, a network of socialist groups around the world that shares a common political outlook. We publish a monthly magazine Solidarity that carries reports from the frontline of fighting for change, features on the history and politics of resistance, and a socialist analysis of Australian and global politics. You can subscribe here. Join us in the struggle to end the wars, inequality and environmental destruction that threatens our world. Please get in contact with us or find out more about our events and the campaigns we are involved in, or come along to our regular meetings. Join our Facebook page for regular updates. United we can win a better world. Solidarity was formed in February 2008 when three socialist groups—Solidarity, Socialist Action Group and the International Socialist Organisation—voted to merge into a new organisation. All three groups shared a common commitment to the politics of the International Socialist Tendency and the traditions of socialism from below. As a result our three former publications Red Alert, Socialist Worker and Solidarity have been replaced by the publication of a monthly magazine, Solidarity and the new Solidarity website. Capitalism is a system of competition, crisis, and war based on exploitation of workers, in which production is for profit not human need. Through environmental degradation and climate change capitalism has become a threat to humanity’s future and life on the planet. Although workers create society’s wealth, they have no control over production or distribution. Capitalism stifles democracy and smothers creative freedom, creating a society of insecurity and alienation. We stand for socialism, a society that would be based on democratically elected workers councils which control and plan the economy to produce for human need and environmental sustainability. The authoritarian states like the USSR/Russia and China were not socialist but a form of state capitalism where workers had no control over society and were denied even basic rights. The working class – because of its role in production – has the power to challenge and change the existing system and create a better world. To help realise this potential we are active building our unions and the confidence of rank and file workers in their own power. What about elections and parliament? Parliament, the army, the police and the courts are institutions of the capitalist state. The state’s role is to maintain the dominance of the corporate ruling class over the rest of society. It cannot be taken over and used by the working class. While parliament can be a platform for socialists and while the outcome of elections matter, real change doesn’t come through parliament. It is won by mass action in strikes, protests and demonstrations. The working class is international and the struggle for socialism has no national boundaries. We oppose everything that turns workers from one country against those from another. Only by struggling together can we successfully challenge the power of the multinational corporations and our own nation states. We oppose imperialism and support all genuine national liberation struggles. Australia is an imperialist power in its own right. We oppose Australian nationalism and immigration controls. We welcome migrants and refugees. We oppose sexism, racism and homophobia. We stand against the oppression of women, Aboriginal people and Torres Strait Islanders, migrants, and lesbian, gay, bisexual, transgender and intersex people. We oppose discrimination against Muslims and Middle Eastern people. Discrimination and oppression demoralises and denies rights to its victims. It weakens working class solidarity by dividing workers against themselves. We campaign to defend and extend all democratic rights. We are active in movements for environmental, social and economic change. We develop the ideas and strategies needed to help campaigns win their demands. We bring together activists in the working class and the other movements to strengthen each movement and build a common struggle against the system. Socialism cannot be introduced from above – through parliament or a coup or by a party acting in the name of the working class. The emancipation of the working class must be the act of the working class itself. Power can only be taken from the ruling class by the conscious action of the vast majority of the working class. We are an organisation of activists, anti-capitalists and revolutionary socialists committed to socialism from below. A democratic revolutionary party is necessary to deepen resistance to capitalism and to build a movement to overthrow and replace the system. Solidarity members are beginning to lay the basis for a party by actively participating in today’s struggles. On Sunday, 3 February, a conference of three socialist groups, Socialist Action Group, International Socialist Organisation, and Solidarity voted to merge their organisations into a united group to be called Solidarity. The merger represents a significant step forward in re-unifying the key groups of the International Socialist Tendency in Australia and the emergence of a new national group committed to building the left and the social movements in Australia. The merger brings together the members of three groups that have played an important role in the fight against the Howard government – in the fight against the cuts to Higher Education and the introduction of Voluntary Student Unionism, against One Nation, on the side of militant unionism in the MUA dispute, the fight for refugee rights, against scapegoating Muslims and against the so-called war on terror in Afghanistan and Iraq. Together with a joint commitment to the politics of socialism from below, it has been the experience of working together particularly in anti-war work and the lead up to the APEC demonstration against George Bush and John Howard in Sydney that laid the basis for forging the unity of the three groups. After ten long years of Howard conservatism, the Rudd Labor government came to office in November riding the wave of anger against Work Choices. The Labor government embodies many hopes for real change. But it also presents a challenge to the Left. Bringing the Burmese and Sri Lankan asylum seekers from Nauru and the announcement that there will be an apology to the Stolen Generations in the opening days of the new Parliament are the first steps to reversing the racism of the Howard government. But Rudd’s promises have been carefully crafted not to upset the top end of town. Labor’s changes to WorkChoices will fall short even of federal Labor policy. They will not restore the right to strike and even AWA’s will potentially be valid until 2012. A mass Indigenous rally on the opening day of Parliament will show the Rudd government that dispossession is not an historical question and that the Intervention in the Northern Territory is repeating the past wrongs. Now Rudd is talking about fighting inflation but not about maintaining the jobs and living standards of workers. The fight for social justice cannot be waged from the sidelines. The unified Solidarity is committed to throwing itself into struggles for social justice, to overturn the legacy of the Howard years and to strengthen the confidence of rank and file unionists on the shop floor. We look forward to working in common struggle with other activists from social movements and the wider left to further these aims. Comments on this site are for debate on the left (fairly loosely interpreted), therefore right wing posts, spam, and other offensive material will be deleted. Anonymous comments are not permitted.